And while I'm doling out thank you's, I want to send a giant one out to all of you. The encouraging comments y'all left on the last post got me through my wallowing session and spit me out on the the sunny side of the street. 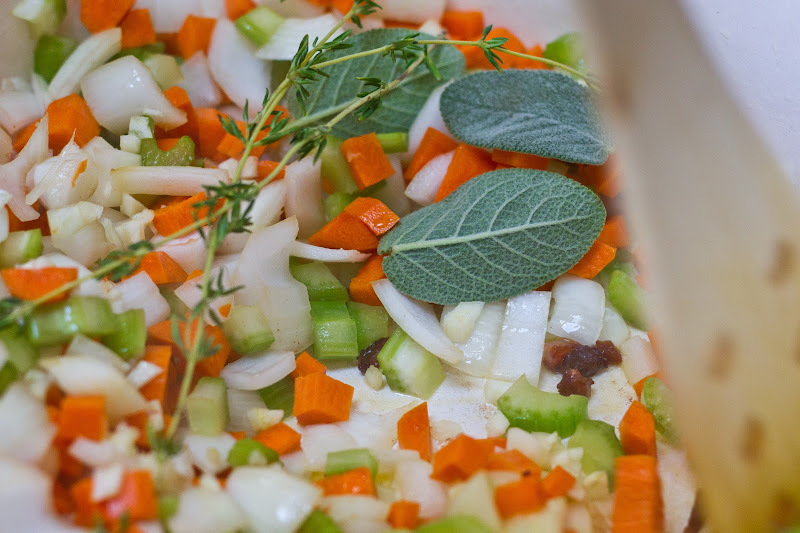 Here's to autumn and stewing meats! Cook over medium heat, stirring occasionally, until tender, about 12 minutes. Pour enough of this liquid into the pot to bring it to the level of the meat and vegetables. Simmer gently until the meat is very tender, about 1 1/2 hours. As the liquid reduces, keep topping it up with the rest of the broth and milk, and skimming the fat that rises to the surface. Super fun weekend! Still eating the bolognese!! I love it! I'm finishing up a (long) month of traveling here in Spain and Portugal, and though the trip was a blast, I'm itching to get back home to my own bed and kitchen. 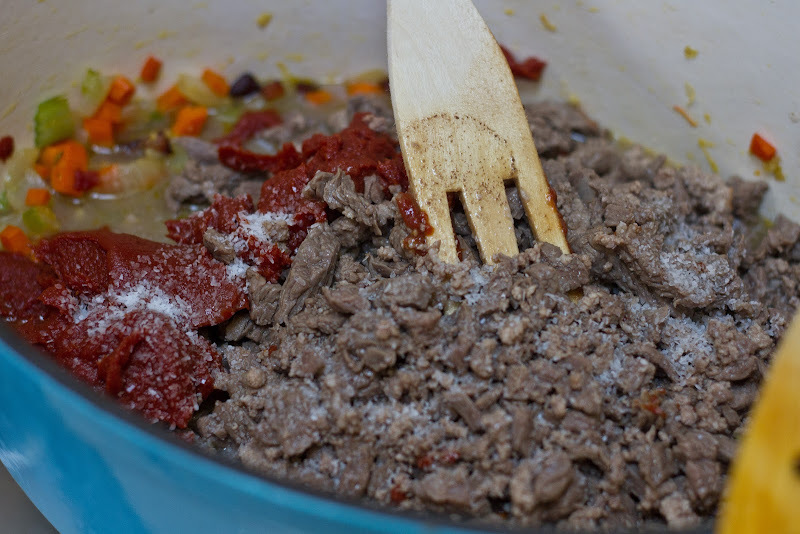 Can't wait to start cooking things like this meat sauce! Also cannot wait to end living out of a backpack. Awwwwwwww! That is the best!! Thank you guys SOOOOO much for having us. We had the greatest time. Love the video! It's real life stop-motion. Is that even a term? Well, either way, it was wonderful. And the salad looks just as delicious as the bolognese. Yum! I love this video. It makes me want to have my own friends visit from states away. Thanks for sharing your lovely time with all of us! What a great blog entry, and I loved the video. Well done! LOVE! I have always wanted to do stop-motion. This one rules - it captures the feeling of an entire evening and I like that. Aw, I love all your videos, but I *love* this one! Know what I mean? p.s. 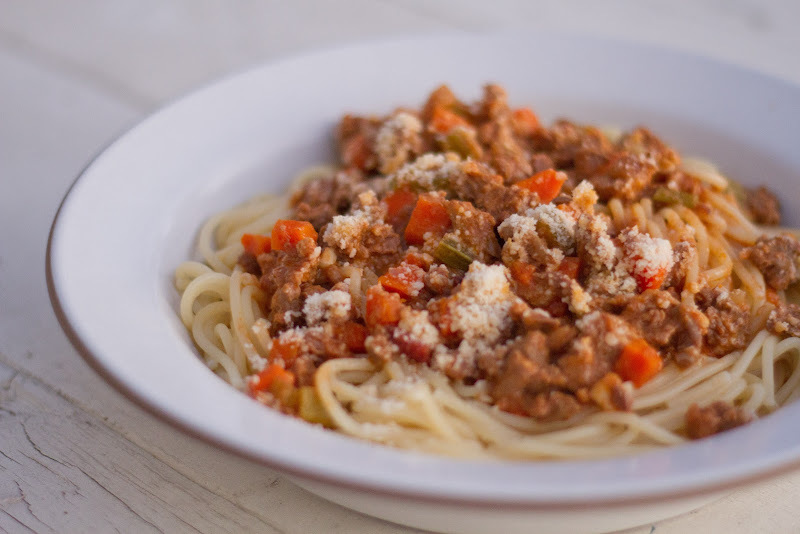 that's a pretty bolognese bowl. YAY! I haven't had a good homemade bolognese in ages--thanks for the reminder! It looks so good. OK, what's that avocado trick? You are a magician! did you use beef or chicken broth? and would you recommend what you used? 1. Yes, the above is NOT the doubled amount. I doubled it (so, two stalks of celery, 2 carrots, etc.) and it made PLENTY. 2. I used chicken broth and totally recommend using that. It's a heavy flavorful sauce already so I'm not sure you really need the beef broth. PLUS, good beef broth is hard to come by. I *do* know what you mean. This video MAKES ME SO HAPPY. So cheery! I have pasta with meatballs on the stove, which is the only reason I'm not stabbing my computer in a misguided attempt to get to that meat sauce, fyi. This is one of my all time favorite cookbooks. I read it and salivate. 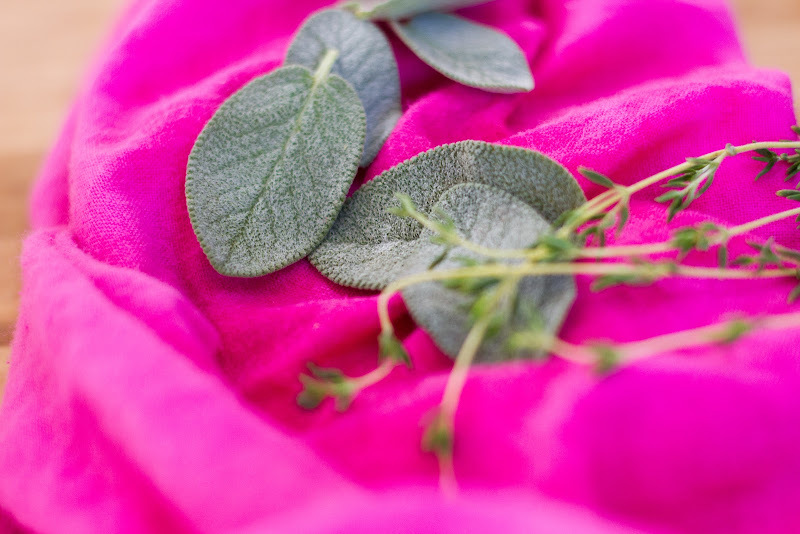 Love the idea of sage in the Bolognese and love this video. Do not love my crappy internet connection that makes watching to video like trying to read a book on a bus bouncing over pot holes. Exxxcellent song selection. Exxcellent lighting. Exxxcellent wardrobe (hiking outfits?). Exxxcellent man chilling on the couch. Exxxcellent friend weekend and exxcellent videooooo!!!!! ha! It was actually my first time performing it. Who knew that if you pre-dice the avocado while it's in the skin and then kind of squeeze it, all of the little cubes pop out!? This is kind of rando, but what kind of pot is that? A Le Creuset braiser? As an occupational therapist who worked in a hand therapy clinic I have to let you know that we saw too many patients with major hand injuries to nerves and even tendons from cutting avocados the way you demonstrated. I love your videos, but that made me cringe! Just Google avocado hand injury, it's a thing. I enjoy your blog so much and I want you to keep safe! Sorry, I should clarify. Never ever cut an avocado while holding it in the palm of your hand. Pre-dicing is awesome, just do it on a cutting board. wowwww, thanks for the info, Robyn. I'll always use a cutting board from now on, I promise!! Congratulations to Bon Appetempt being named by TIME magazine as one of the Best Blogs of 2012! A well deserved honor! I love The Art of Simple Food. It's a cookbook I reference often. Love the illustration and the photos! Great job. B) so what was the scoop on the sauce? 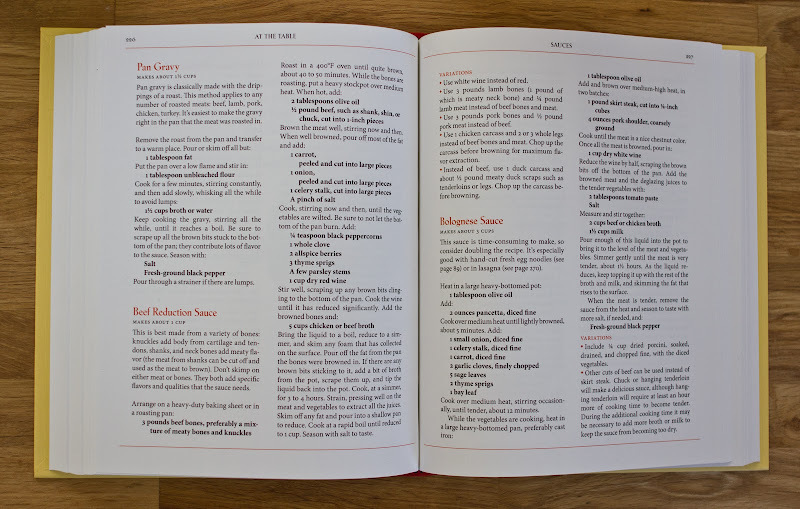 I'm looking for an epic recipe to make for a dinner party in the next couple of weeks. So, so cute and yummy-looking. But I'm most obsessed with your bright pink tea towel! Where's it from?? A) thank you!! And please, come on over! Thanks! I actually DYED that tea towel myself. I know, I know. http://www.dickblick.com/products/dylon-fabric-dyes/?clickTracking=true <--Flamingo Pink. That being said, I have another hot pink tea towel I got from Heath Ceramics... don't think they still have it, but maybe?? I loved this video so much. So beautiful and atmospheric, or something. Loved it. Made this last night for new neighbors (in my new home) and the first thing they said walking in was "it smells delicious!" which it did! Thanks for sharing this keeper recipe! It's so good my SO had it for breakfast this morning!!! You're a pretty cool neighbor. Scott just watched this (he loves LA and I knew he'd like this) and he said "oh WOW she just made a Manhattan and drank it at the exact moment in the song where Cat Power says Manhattan!!!!" I hadn't noticed that. Well played, Amelia, well played. 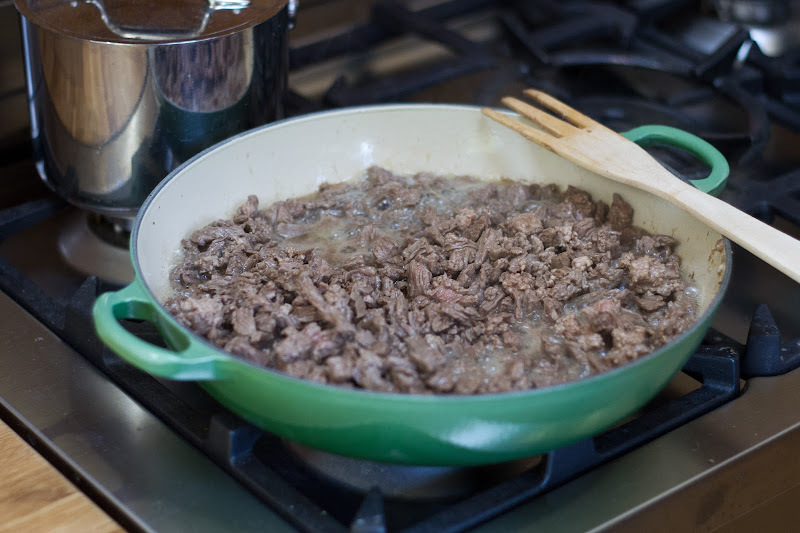 I know we're coming up on 5 years later, but I just made this last night and it's nowhere near as thick as your sauce--I simmered for 1.5 hours, so was afraid if I went any longer I'd overcook the beef. I put it in the fridge because we had something else for dinner — did you simmer yours longer, and do you think it's OK to keep going on another day and simmer it down further to get the proper consistency? 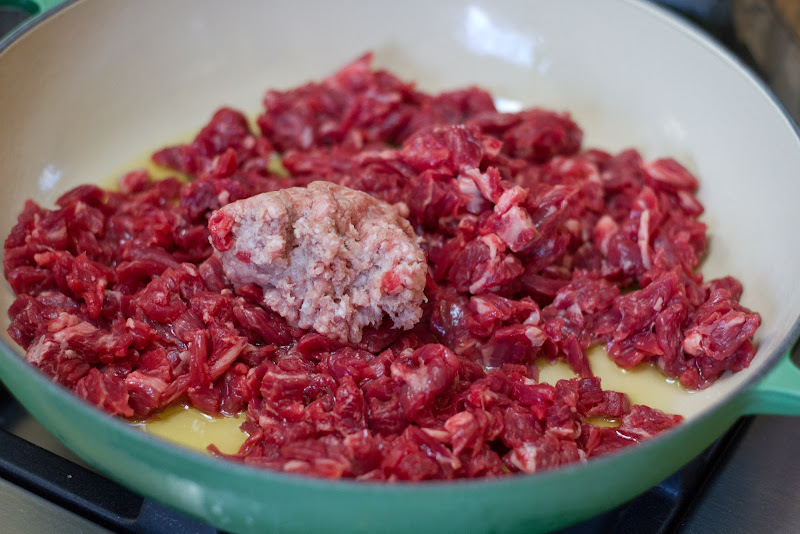 I also diced my steak really really tiny and it took FOREVER--I guess I thought 1/8" meant something like a mince, but yours looks much chunkier than mine and sounds like it still turned out great! 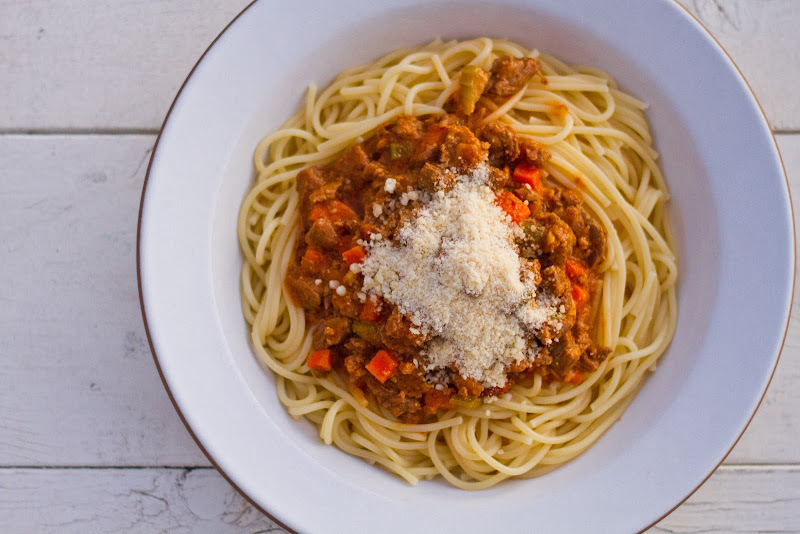 I love “The Art of Simple Food” and just about everything else I’ve made from it has been delicious, but this one threw me for a loop (maybe because I've never had bolognese before, and there was no pic--thanks for yours and your video!). I never got a reply before trying, so I thought I'd report back for posterity--it did work! I took the too-liquidy sauce out of the freezer and put it back in the same enameled dutch oven I'd used before, and simmered it down about halfway, it took about 30 minutes on half the amount (I'd made a double batch in the first place, so I just took one portion out of the freezer and left the rest for another time). Delicious! No worries! I know it was an old post. Thank you for it though--sometimes these posts just keep on giving! I just wanted to reply with my experience in case someone else had the same problem in the future.